“In devising its unprecedented Dual-Wing mechanism, the Manufacture Jaeger-LeCoultre not only laid the cornerstone of a new collection named Duomètre, but also added a whole new chapter to watchmaking history. Not so long ago, entrusting a traditional watch movement with the mission of driving an additional complication alongside its time indications implied the risk of jeopardising its operating accuracy. The wealth of ingenuity deployed by the finest watchmakers could not counteract physical laws nor overcome micromechanical limits. Nonetheless, the movements they succeeded in making were deemed satisfactory depending on whether the focus was on technical performance, precision or aesthetics – but a choice had to be made between one or other of these three parameters. Owning a complication watch uniting these three ingredients appeared to a utopian pipedream. And then one day, in the workshops of the Manufacture Jaeger-LeCoultre, at the heart of the Vallée de Joux, in Switzerland, an idea emerged: what if one were to begin with a blank page? What if, instead of improving existing technical solutions, one were to start from scratch? What if, rather than aiming for evolutions, one were to opt for a revolution? This reasoning would give rise to the Dual-Wing concept, featuring two separate and independent mechanisms housed within a single case: one of them responsible for powering the time indications, and the other for driving an additional function. Two separate and independent mechanisms united in one case? If that were in fact all it took, the Jaeger-LeCoultre watchmakers would “merely” have created a masterpiece of miniaturisation. They actually did far more by linking the two mechanisms to a single regulating organ, thereby guaranteeing chronometer-worthy operating accuracy. So yes, the Dual-Wing concept that was the starting point for the Duomètre collection is indeed a revolution, since it now affords the possibility of possessing a watch reconciling accuracy with unprecedented horological complexity. While the principle was a watch connoisseur’s dream, the theory still had to be translated into concrete reality. The first challenge of the Dual-Wing concept was to power a chronograph, and the birth of the new Duomètre à Chronographe represented one of the major events of the 2007 watchmaking year. Gyrotourbillon 1, Reverso Grande Complication à Triptyque, Reverso Gyrotourbillon 2, Duomètre à Grande Sonnerie, Master Grande Tradition à Grande Complication, Reverso Répétition Minutes à Rideau… Over the past decade, the Manufacture Jaeger-LeCoultre, building on a longstanding tradition of inventiveness and unique expertise, has displayed exceptional creativity, achieving technical performances that have enabled it to develop some of the most noteworthy complications of the early 21st century. Armed with exceptional horological know-how, Jaeger-LeCoultre gladly starts with a blank page for each new creation in order to combine aesthetic elegance, technical performance and unique functions. This approach has given rise to the Gyrotourbillon, the Crystal Gong, the expression of civilian, celestial and perpetual time on three separate faces, the tourbillon that won the first timing competition of the 21st century, the Tourbillon with cylindrical balancespring, the Flying Tourbillon indicating celestial time, the Minute Repeater activated by a metal curtain, as well as the Grande Sonnerie faithfully reproducing the Westminster chime. 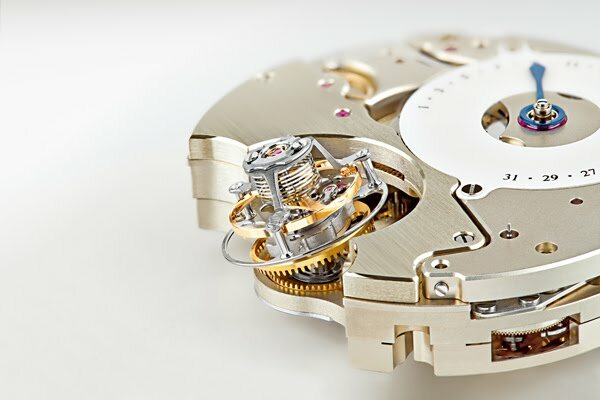 When Jaeger-LeCoultre began reflecting in parallel on a new chronograph movement capable of maintaining the same precision, whether or not the chronograph function were activated, watchmakers did not imagine that they were going to create a whole new watch movement concept. The latter proved so innovative that it paved the way for unprecedented functions and gave rise to the Duomètre line. The principle behind the revolutionary Dual-Wing concept involves two independent mechanisms, each with its own source of energy, but sharing a common regulating organ. This principle gave rise to the first chronograph maintaining the same level of precision whether in chronograph on or off mode , the first calendar-display watch adjustable to the nearest 1/6th of a second, and the first Grande Sonnerie model to faithfully reproduce the tune chimed by Big Ben. Another distinctive feature of the Duomètre line is the arrangement of the dial displays, which reflects the dual structure of the Dual-Wing concept. An hour display off-centred along the 3 – 9 o’clock axis; twin indications of the respective power reserves; hands in two different colours; grained silver-toned finish: all these fascinating details combine to endow each of the Duomètre models with a unique aesthetic and a strong identity. A striking design, a unique function and an aura of refinement in harmony with the finest watchmaking traditions: the new Duomètre Sphérotourbillon combines all these ingredients. This Grande Complication model vividly demonstrates that it is in fact possible to combine technical performances, discreet aesthetic elegance and spectacular horological complexity. Precision is the cornerstone of the Dual-Wing concept and was the watchword for the Jaeger-LeCoultre watchmakers in their reflection leading to the creation of the Duomètre Sphérotourbillon. The result is a watch that can legitimately claim to be the first tourbillon watch adjustable to the nearest second. For what’s the point of precision if you can’t display it? There are indeed very few tourbillon models with an extremely readable display of the seconds in a dedicated subdial, and even fewer with a stop seconds device. Certainly none until now had ever enabled the user to stop the seconds hand and bring it back to zero in order to perform an ultra-accurate time setting. Initially devised for pocket-watches, the traditional tourbillon does not serve to compensate for the effects of gravity in all positions. An additional rotation axis must be added in order toachieve a three-dimensional rotation movement and thus prove itself more effective in all positions that a wristworn watch may adopt. The openworked dial provides a fascinating view of the tourbillon performing an extremely unusual rotation movement. As well as revolving around the axis of its titanium carriage, the tourbillon also spins around a second axis, inclined at a 20° angle. The combination of these two distinct and fast rotations (respectively 30 and 15 seconds per revolution) serves to free the watch from the effects of gravity.